Chris Heston, the San Francisco Giants’ right-hander who is in their rotation because Matt Cain isn’t, and is a Giant though they released him not two years ago, on Tuesday night no-hit the New York Mets at Citi Field. Amid a distant chant of “Let’s go, Giants” in a city that hasn’t completely forgotten his team’s roots, Heston struck out Ruben Tejada on a fastball that back-doored and clipped the upper-right corner of the strike zone for the 27th out. Heston slapped his glove and awaited the arrival of catcher Buster Posey, who flipped the game ball at Heston, who dropped it, and they embraced. “I’m still not sure what just happened out there, to be honest with you,” Heston told reporters afterward. 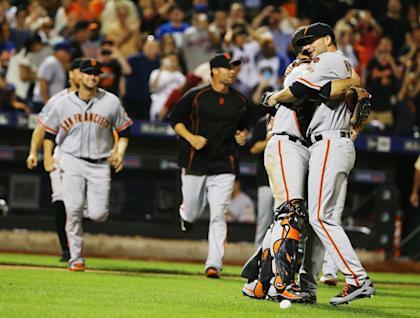 When he celebrated, it was for a special game, the 288th no-hitter in league history and the 17th for the Giants. For a win, too, 5-0 over the Mets. Heston might also have been honoring a journey of some mileage. He was a 12th-round draft pick by the Giants in 2009, but not before he was drafted in the 47th round out of high school (Minnesota Twins) and the 29th a year later (Washington Nationals), and declined to sign both times. Four-and-a-half seasons into the minor leagues, he struggled in Triple-A, was designated for assignment because the Giants required a place on their 40-man roster for journeyman outfielder Jeff Francoeur, and went home. Four months later, after Francoeur had batted .194 over 62 forgettable at-bats, Heston re-signed with the Giants. Tuesday night, he was a 27-year-old rookie at a time when rookies are getting younger, not older, in his 13th career start. He stood poised against a Mets lineup that is not terrible at home. He allowed three baserunners, two in the fourth inning, when he hit Ruben Tejada with a pitch and grazed Lucas Duda with another, and another to start the ninth, when he hit Anthony Recker with a pitch. He did not walk a batter. He struck out 11, the last with his 110th pitch. Heston moved around his sinker, his slider, his curveball and his changeup. Generally, the strike zone moved with them. More than a few Mets stiffened at the calls, often just before returning to their at-bat or, then, to their dugout. It speaks as much to the late action on Heston’s pitches, however, causing the Mets to give up on pitches Posey would frame up for another strike. Between innings, Heston sat alone on the back of the bench in the third-base dugout, often lodged between a water jug and a bucket of gum. He gnawed at his fingernails. Then he’d hop to his feet, in the ninth inning with a hard exhale, and trot to his place 60 feet from Posey. Long before the ninth inning, Posey said, he measured Heston’s stuff, his command, and started thinking a random night in New York could be special. Competitive in spite of the early losses of Cain and Jake Peavy, the Giants can in some part thank Heston. On his right sleeve, a patch spoke to their championship from October, a season in which Heston contributed 16 outs, none in the postseason. Along comes 2015, down goes Cain, and Heston is 6-4 with a 3.77 ERA. He struck out 10 Houston Astros and walked none a month ago. (A week ago, he didn’t survive the fourth inning against the Pittsburgh Pirates.) The last Giants rookie to strike out at least 10 and walk none was Tim Lincecum in 2007. Four of the last 12 no-hitters, dating to Cain’s perfect game against the Houston Astros in 2012, have been thrown by Giants. Lincecum threw the other two.